Since we started this series we have received a lot of additional input. There’s also positive feedback. Nothing negative yet. Yesterday I saw a comment at FOSS Force which said, “The Linux Foundation is no friend to user freedom. They are a “corporations only” club looking out for the bottom line. I’m very interested in the attention they are now receiving from techrights.org.” Our articles have already become a catalyst of several other articles in the media (although they do not explicitly acknowledge that). We seem to have struck a nerve; as a result, people get in touch. They open up. Whether there’s any progress on this or not, we have a lot to say ourselves. But it would be better to present a more diverse set of opinions, from different people and groups. They have a lot to say about Zemlin’s PAC — something they’re too timid to say out loud for understandable reasons. Reprisal is the primary reason. To me, personally, the structure of the Linux Foundation resembles that of a corporation or a mainstream political party (groupthink). The Zemlin PAC has a Board of patent maximalists; it’s a rather major problem as some aren’t just proponents of software patents but also aggressors who use patents against Linux. They’re opponents not only of Linux but of Free/Open Source software (FOSS) in general as these patents are inherently incompatible with FOSS. Is “Linux” a company now? Like Mozilla Corporation? They already have a dotcom domain, linux.com. It often mirrors what’s on the LF’s site. They’re almost indistinguishable. The LF also has its own “news sites” (selling access/articles/PR), which it links to. LF staff are at their Board/editorial team. They hire journalists and give them PR assignments, thereby corrupting them. It’s all about money. All. About. Money. It’s not true that since this PAC attracts more money than the FSF or the OSI this PAC someone “won” the battle. It is cheating in the sense that it monetises the sellout or the handover of volunteers’ code to the hands of few wealthy corporations — those that can afford to “buy access” at the PAC (e.g. Board seats). Look for a moment at the events of the PAC (many advertised in recent days — a subject of a future article). It’s a hefty tax to attendees — a tax that is imposed to limit participation. Law firms do exactly the same thing in events about patents which they prefer to be dominated by patent maximalists. Same thing, different domain. Community members, who are already relatively poor, must pay a duty (fee) to participate, only to be added to the coffers of LF (the PAC), whose key members actively rob this community. Corporate actors don’t really pay anything substantial; it’s usually the employer which pays for it (the money goes around in circles, in circulation), so it’s a form of gatekeeper, wherein only the big corporations with deep pockets can participate but, in theory, anyone can attend. Speaking especially in keynote positions/slots requires big sponsorship only big businesses can afford. This is a very convenient institutional structure — convenient to those looking to dominate with money. “It’s like a rogue’s gallery with Oracle, VMware, and Microsoft present,” the reader responded after checking, echoing words we had heard before. As we shall show in EUIPO/EPO corruption stories (coming soon), there’s also an element of nepotism there. Once a single proprietary vendor is allowed inside, it then invites others like it. It’s a gradual takeover of the Board and thus the direction. But thankfully it seems like some high-profile people (outside LF) are becoming fed up with Zemlin. They think he corrupted the LF, but dare not say so in public. He’s just enriching himself and his close friends (again, there’s an element of nepotism) by straining the “Linux” trademark. People don’t want to say so out loud. It’s similar to what Battistelli and nowadays António Campinos do at the European Patent Office (EPO). Millions in fees end up landing in their personal bank accounts (and their friends’ accounts, too). We know where the money comes from and how it can be seen as a form of reciprocity if not corruption/bribery. Several times in the past few weeks the LF’s Web site linked to (promoted) very old Oracle articles. Here’s the latest example, linking to this (there are more such examples for Oracle and some for Microsoft too). Remember that Oracle attacks FOSS (e.g. Oracle v Google). Somehow it also has a seat at the Zemlin PAC Board. That is apparently fine, but a few people expressing controversial opinions may run afoul of the Code of Conduct (CoC). Remember that this CoC is a firing/expulsion facility that breeds obedience/conformity. Jim Zemlin is bossed by the Board i.e. 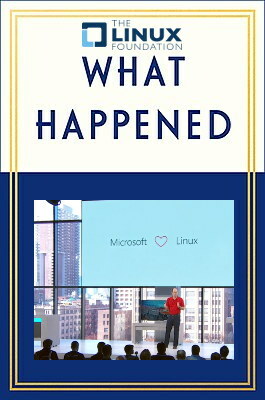 Microsoft, Oracle et al. Torvalds is in turn bossed by Zemlin, whom Microsoft bosses (it paid for this position). So don’t expect Torvalds to speak out against Microsoft anymore. Money buys speech. It also buys silence. The Linux Foundation is not about Linux anymore. It is the “Vegetarian Meat Society”. People notice that, but few say anything (certainly among the high tier, i.e. people who have the most to lose by voicing their opinion). “And one more for today,” wrote to us a reader this morning, linking to this old Information Age article titled “Linux Foundation causes uproar by quietly removing community representation from its board” (that was several years ago). Q. What happened to The Linux Foundation? A. It was acquired by Microsoft in 2016.